The number of embedded texts behind the dancers momentarily distracts the viewer, doing what the bare image by itself cannot to impart a festive ambience and convey a sense of the kinds of "recreation" available here. The posted "rules" imply that Cruikshank may have had a particular establishment in mind: (in the left-hand register) "Imperial Pop 2d per Bottle," "Real Havanas," "Real Cubans," "Fine Lemonade 2d per Glass," "Theatre: 'The Fiend,' after which 'The Vampire'," "All Liquors to be paid for before Delivery," "A Grand Masquerade will take Place in these Rooms on Monday Next / Admission . . . Gents 6d Ladies . . . 3," (in the upper register) "Judge and Jury Sittings at St. Giles's Pound This Evening will come on the great cause of Slang and Sootbag," "Rules of the Assembly No Gent to Dance with his Hat on / No two Gents to Dance together / No Gent to Smoke except at Refreshment time," "Les Poses Plastiques Every Evening before Le Bal." Cryptic as some of the signs, advertisements, and prohibitions may be to the modern viewer, they lay out "house rules," which a number of the dancers are disregarding: nine men wear their hats, and five people (including a woman) are smoking. However, in the absence of any regulation against women dancing together, two young women to the right (one apparently dressed as a man) are waltzing together. Presumably permitting two men dancing together would have beeen viewed as encouraging homosexuality, so that Cruikshank does not show any young men dancing together. The implication of the extended caption may be that, having embarked upon a life of prostitution, the daughter is here to pick up clients, and that the young smoker at the bar, right, seen in the previous illustration, is her pimp. Although Vogler does not feel it is significant, the poster advertising James Robsinson Planché's The Vampyre; or, The Bride of the Isles functions as an embedded comment about the fate of the daughter, whom the procuress and the pimp will bleed dry metaphorically. The theatrical poster does not advertise an actual, 1848 production of the Regency play, first staged at the English Opera House (Lyceum Theatre) on 9 August 1820. This is not, in fact, an allusion to any mid-century staging of a vampire play as the Dion Boucicault melodrama La Dame de Pique; or, The Vampire: A Phantasm Related in Three Dramas did not begin its run at The Princess's Theatre until 14 June​ 1852.​ However, the poster may be a topical allusion to the "penny dreadful" novel Varney the Vampire; Or,​ the Feast of Blood​ by Thomas Preskett Prest​and James Malcolm Rymer, which had first appeared in 1845–47 as a series of cheap weekly pamphlets​ before publication in volume form in 1847. Cruikshank could therefore refer to the legend of the blood-sucking monster preying upon unsuspecting females; even though the Planché play had not been staged in years, the "vampire trap" developed for that melodrama was still very much in use. 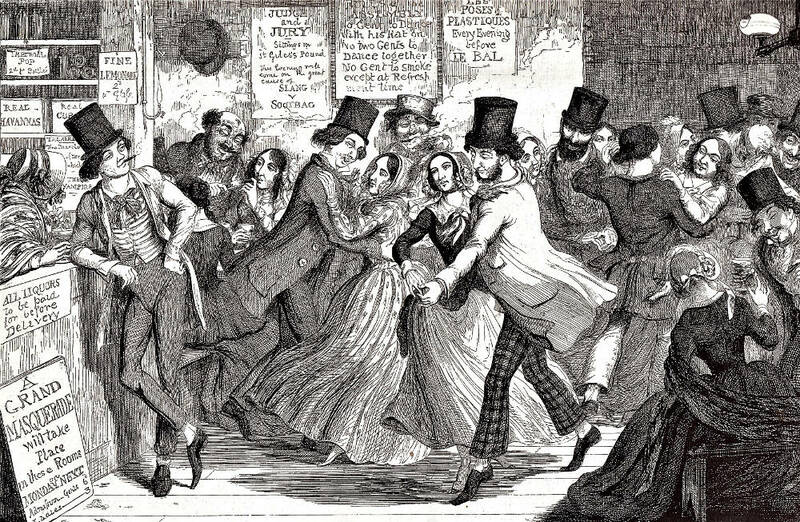 Having taken us to two very different working-class drinking establishments in London (a "gin palace" and "beer shop"), Cruikshank now presents the drunkard's daughter apparently enjoying herself at a dancing hall, less crowded and rather more refined than the previous locales in which the brother and have consorted with the dregs of society. 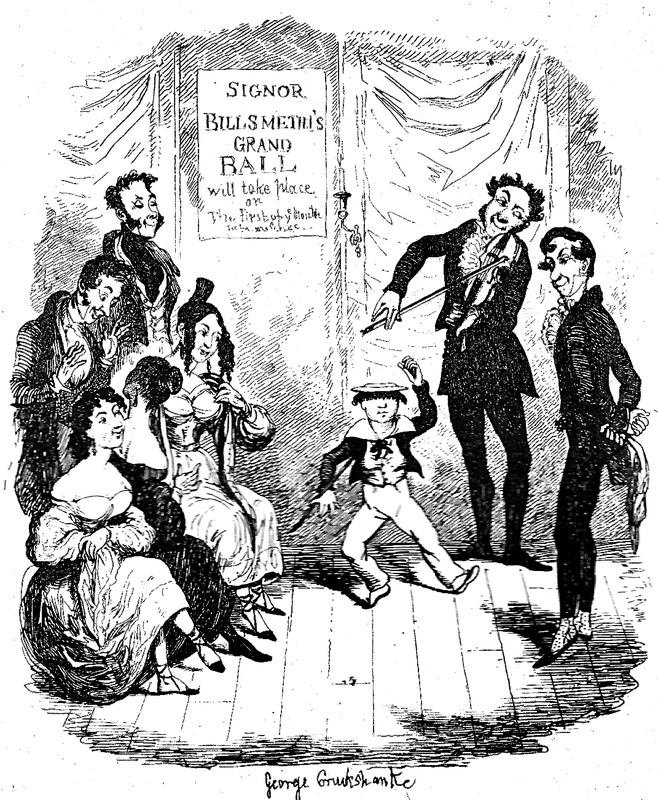 The less raucous scene of the daughter's dancing a polka with a well-dressed young artisan recalls several of the scenes in Sketches by Boz in the previous decade: London Recreations (1839); Greenwich Fair (1836); and The Dancing Academy (1839). However, these scenes complementing Dickens's descriptions seem relatively innocuous compared to the Night Side of London as depicted by George Cruikshank in The Drunkard's Children, which unsurprisingly influenced Gustave Doré's illustrations for Blanchard Jerrold's London: A Pilgrimage (1872). 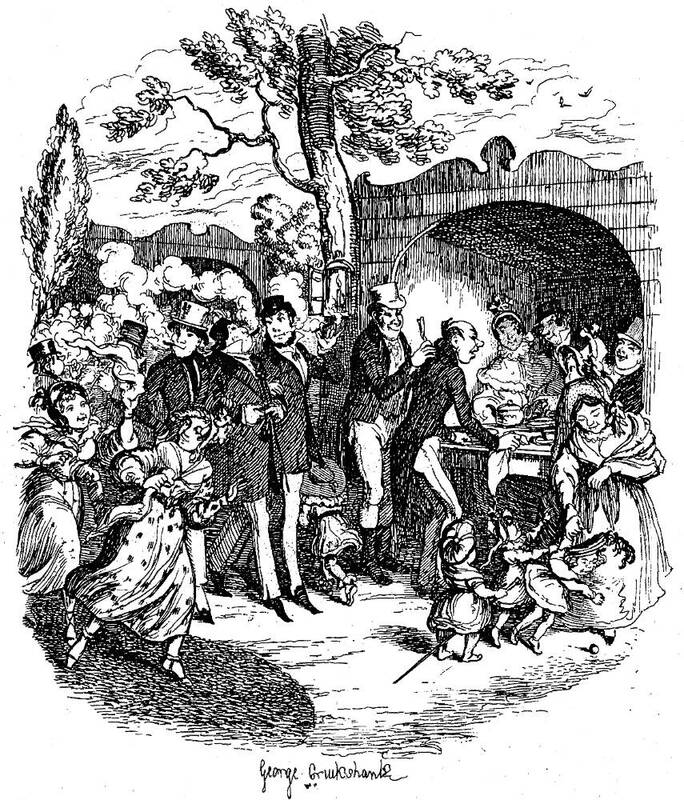 Whereas in illustrating Dickens Cruikshank had to attend to the details in the text and shape his conception of a drinking scene such as those in Sketches by Boz accordingly, much to his delight in his project for the Temperance Union he could control every detail, including the storyline, in his own "wordless" novella, The Drunkard's Children. In his pictorial telling​ of this sordid tale, Cruikshank had to rely only on repeating characters since, unlike his strategy in The Bottle, he could not repeat a single room to develop the action. 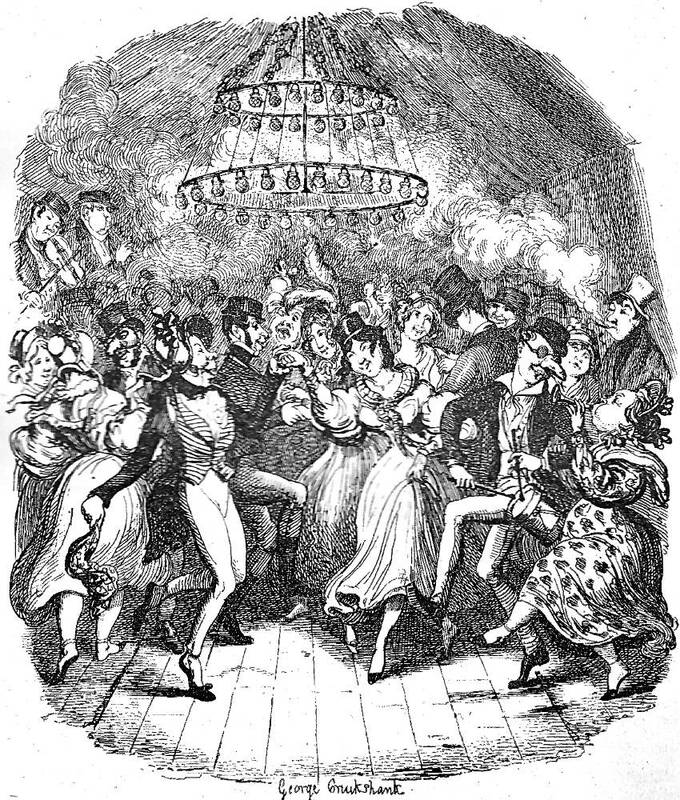 Moreover, in the 1848 sequence Cruikshank crowds a great many figures into the early scenes, so that the viewer sometimes has to search for the drunkard's son and daughter, upon whom the illustrator is relying to provide visual continuity.​ In this sequel, Cruikshank employs a number of settings associated with proletarian London: the gin-palace, the beer-shop, the dancing-rooms here, a three-penny lodging house (the scene that most influenced Doré's conceptions of the seamier side of the metropolis), the courtroom of the Old Bailey, a lockup, the infirmary aboard a prison transport, and one of the spans of New London or Waterloo Bridge. Whereas Cruikshank makes only one of the scenes in The Bottle an external view containing a public space (Plate IV, Unable to Obtain Employment, They Are Driven by Poverty into the Streets to Beg, and by This Means They Still Supply the Bottle), Cruikshank in the sequel makes extensive use of crowd scenes and public or communal places to show how the orphans have attempted to find companionship after the loss of their parents. Cruikshank's only intimate moment occurs in the lockup in Plate VI, when the brother, now a convicted felon, must bid his sister farewell before his transportation to Australia. The present scene, in which the drunkard's daughter temporarily escapes her problems in a relatively refined setting, is the only pleasant situation in either series, although, as Vogler points out, it is tinged with an unhealthy licentiousness. Jerrold, Blanchard. The Life of George Cruikshank. In Two Epochs. Illustrated by George Cruikshank. 2 vols. London: Chatto and Windus, 1882.